Create Article Titles that WORK! See through the eyes of an EzineArticles Editor to discover the secrets to writing great article titles. Have you ever wondered what an editor was thinking or how they made their editorial decisions regarding your article? In this post, the first of many blog posts that will give you a “through the eyes” view of our editorial thought process, we’ll share (5) fictional article titles that each contain a common title error. We’ll then give you an EzineArticles Editor’s thoughts on how those titles can be improved. It’s important when evaluating an article to look for delivery on the title. If it says “7 Great Habits”, it should indeed deliver 7 great habits! If it’s unclear, or you have to fish too long to find the (7) habits, then the title does not deliver and the reader will not get what they expected. Deliver 7 Tips that are easily identifiable. Bullets and headings work well for this. You’ll notice we also polished the title with positive words like “Behaviors” and “Discover” versus words with a more negative connotation like “Habits” and “Learn”. Good Title: New Zealand Real Estate! This is a niche or locale-specific title. While focusing the content of your articles on niche markets can be highly effective for increasing the flow of high-quality traffic, the article has to follow through on any claims made by the title. Some authors use article titles that suggest niche articles, but only include a liberal sprinkling of niche keywords and provide no specialized content. Keep in mind: A good niche article should be locale-specific throughout. If your article loses its value with the loss of the locale, then your article was niche/locale specific. Titles should not be in all caps. The first letter of each major word should be capitalized only. If you submit a title in all caps, we will change it. Although acceptable, this title does not deliver the whole picture. Understand that your readers see your title first, then your article. Your title should be attention-grabbing and tell your reader exactly what they will be receiving when they read the rest of your article. Great Title: Latest Successful Diet and Weight Loss Tip – Lose Weight by Eating a Bushel of Apples! The bad title will get your article hard rejected. Hard rejections mean that your article will be removed. Looking at this title tells us that you did not take the time to review our editorial guidelines or check your spelling and grammar to build credibility. It’s also obvious you don’t want to take the time to fix or review it. We would consider rejecting the good title for excessive keywords. A great title can have multiple keywords… if cleverly placed. The keyword here is used twice, but cleverly. This is both good for SEO and delivery to your readers. Download this PDF file to discover more about the effective use of keywords. We’ve only scratched the surface in this post. There are literally hundreds of tips for writing great, effective article titles. Have you got a few? Share them by leaving a comment! Then go write some great titles and, better yet, write and submit the great articles to go with them! In one of the previous posts about creating titles, one man had a great system of creating a title for an article which was very smooth–it didn’t require a “gap” or 2-part title. I hope he will comment again. It looks as if you recommend placing the keywords at the beginning of the title. As with all SEO, great titles can surely peek interest and get click throughs. Intrigue the surfer. It took forever to polish this post, so I hope this helps anyone struggling with titles. 1. Relate with your readers to make your titles sound Interesting. The first title is flat out boring, but once I added ‚¬“rakes in the cash‚¬ to the second title, I created a vision in my readers mind that relates to their business and objectives. In this example, I strengthened the title by stating a specific outcome my readers would receive using facts and statistics from the previous article title mentioned above. Most important though, long titles always sound better. If you have an article that has hundreds of page views, then you have a winner. Make one change to the title as in the example above and simply write new tips, and you’ll have another article that drives traffic to your website. Not to mention, you won’t have to spend hours writing new titles. Thanks Chris, I always appreciate your tips! Writing good article titles actually falls in the realm of copywriting. Sort of. To that end, here’s a link http://www.awaionline.com/2002/11/headline-archetypes/ to over 50 very cool headlines you can use for your article title. Good points from Ezine and also Robert Nugent above. I like to use “keyword” plus “benefit” in titles. Great information and advice that will help me create better titles in all the material I write. And, Thank You Robert Nugent, for posting your comments which, I thought, added a lot of value and insight. The first thing a potential reader sees is the title. If it lacks clarity, or doesn`t grab the interest in some way, it is unlikely to tempt someone to look any further. Thanks for the tips. Not necessarily. We don’t want to encourage you to have keyword dense article titles that don’t make sense and fail to deliver. We want to encourage you to write titles that work for your market and best match what others are looking for. Focus on delivering a good title that fits your content and grabs the readers attention. Wow! Thanks to all for the great info on this blog. Actually, the things that make a great article title also make a great press release title. The big difference is how you write to your audience and their particular “WIIFM” (What’s In It For Me). For press releases, you’re not selling a product or service, you’re selling your information in the hopes it’ll be “picked up” by the press. So give them a reason to WANT to read it and pass it on to their audience! Outstandind content, on how to write articles. Great tips, great content, great article.. Interesting article. My problem with it is the use, or misuse of a plural referring to a singular. LIke this piece:… and tell your reader exactly what they will be receiving when they read the rest…. Correct English still requires the use of his, which is singular. I know it is an effort to be politically correct, but it shows a great lack of dedication to the proper use of English. If you don’t want to use his, then make the antecedent plural simply by adding an s. In the case it would be readers. So, please, you above all people should set a good example. Great article. Thanks for the tips, it’s amazing the differences that subtle changes can make. I thought I knew how to write a good article title – and I did. I didn’t know how to write a ‘great’ article title! Thank you to Robert Nugent too. His examples were excellent. I will certainly be using these tips iin the future. All of the comments listed above were extremely helpful. Thanks to everyone that had input to this. Robert thanks to you especially for putting in so much effort, it was well written and very helpful. I have tried revising titles on several occasions and it very definitely made a difference each time. Excellent examples of good titles. Excellent advice and article with pdf – thanks too for the links to Google. And full marks to the creative team for the eyecatching photo of the model – Penny? 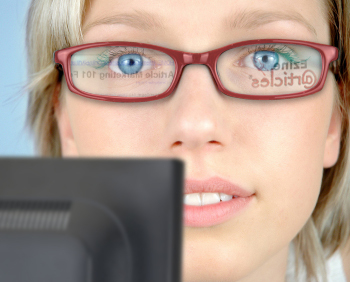 with the e-Zine logo reflected in the lens of her spectacles – really clever! Was the photo Photoshopped or are the model’s eyes really that blue? Ahhh the magic of licensing stock images and Photoshop. Not being a copywriter, and having only blogged for the past year, without any training other than what I’ve picked up from people like yourselves, I’ve found this really useful. I can see now that my most popular posts, with visitors’ views numbering in their thousands on both EzineArticles and (with different titles) my own website, have come about when I’ve used keyword plus benefit. Titles like Eldest Child Syndrome – Are You What Your Parents Have Made You; The Causes of Illiteracy – Is It As Simple As A “Proper Education?”; and Bereavement Poetry meet many people’s needs – if not for themselves then for family members and friends. But it’s only now that you’ve brought it to my attention that I’ve realised this. Duh! Thank you for that. Forgot to say in my post above – that it’s not always the most hits that secure a viral result. I’ve found that sometimes, titles that attract the most hits are not, necessarily, the ones that get voted for, or reprinted. For instance, Payment For Grandparents, Is That The Right Way To Go? has under 100 hits, but is my most reprinted article. And Middle Child Complex? Or Sibling Rivalry – again with under a hundred hits – received 5 stars in a vote. I’m not sure that this adds anything of value to the debate, but it is a conundrum, isn’t it? I really enjoyed the article and wanted to add a web site that is not mine, but I have used to get some pretty interesting results. aminstitute.com/headline/index.htm – “Title Analyzer”. I think I found the key to the algorithm, but I will never tell. A very good piece with great advise. The atricle also brought out some wonderful comments from others as well. As a follow up; the atricle has brought out some wonderful comments from others on the use of keywords and making titles enticing. Sorry about the misspell (Article). “Keystrike” error. Now that sounds like a possible subject for another instructional article, does it not? Interesting ! this is a wonderful article, what I am searching for. This is one of the most interesting and useful information for us. I think these are the great technique but now a days search engine are smarter than human and for that we need to be very much careful while writing an article. I also like to add some techniques which might be useful. like suppose i am searching for flesh problem than i suppose to write How to solve hp flash problem? Means, which question are start with “wh” & “how” that might be beneficial for other.